A tropical cyclone is about to hit and Sam and his little cousin have been kidnapped by a panicking store robber. 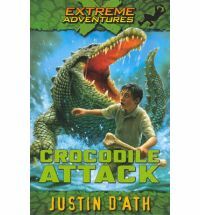 When the getaway car crashes into the rising, raging Crocodile River Sam must do everything he can to keep them both alive. He faces one terrible even after another; a sinking car, a wild boar, the storm raging and the river continuing to rise. Sam must push himself further than he ever would have though he could go. This is the first of the Extreme Adventures series and it would appeal to those who like their action to not let up.